Jetpack Joyride Master is our newest action arcade game starring the handsome hero Jeff Powers. Help him on his journey through a deserted space station and avoid rockets, evil robots and other obstacles. Collect as many coins, tokens and burgers to buy special power ups and upgrades for Jeff. 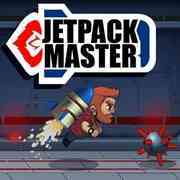 Will you become the Jetpack Master and beat the high score?